If anyone took the time to analyse my blog, there would be a few words that showed up regularly. Like, really regularly. Cake, Leila, Lipstick and Lazy. Infact, (given an extra 7 hours in the day) I could write a blog about lazy. Though such dedication to detailing my idleness would defeat the purpose of the exercise somewhat. 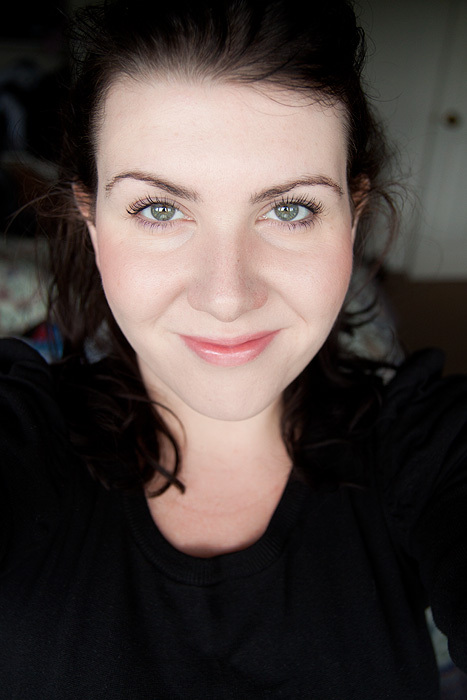 So, instead… I’ll show you my lazy bank-holiday FOTD. All you can really see is the mascara right? Well… I’d like to tell you that I carefully engineered it to look that way. Yano, the not-natural, natural look? Infact, I really didn’t… This was my FOTD for my Mum’s 70th Birthday on Sunday. A special occasion. This… my ‘special occasion’ face. My makeup is weeping from my loss of mojo and complete lack of inspiration. Lovely products but look… 7 products for a ‘special’ FOTD? That’s lazy. I’ve confused ‘whee, this a great opportunity to PLAY with your face!’ with ‘make yourself look presentable but ultimately dull’. I think that I’m just not used to having the time to do things like that and so when I do get the opportunity… I don’t know what the hell to do with it! Would you be kind enough to inspire me with some of your favourite bloggy peeps who do awesome makeup please? This boring old cow needs some cosmetically-charged awesomeness to get her through the week. I’ve missed you! I think being in your nighty at 8.22 on a BH morning is the law. At least it should be. Hope you had a great day at Westfield! I like watching the Pixiwoo girls for a bit of inspiration – I won’t do the whole look, but I often come away with ideas about using different colours or a new technique/way of applying something. Into the Palette is also good, because it takes you through step by step. I like beautybloggingblonde’s videos a lot too (and she has a lovely voice, very soothing). Yeah, it’s true about appropriateness but when you have an excuse for the time to play and still manage to do the same face you do everyday… you either need a big makeup clearout or get inspired! You look really lovely. Also, your face is getting skinnier! My Mum would have raised an eyebrow in a “you look ridic but the eyebrow is enough to let you know that” kinda way! I agree, I think this is spot on for a mother’s birthday do. Anyway, if you can get away with looking this gorgeous with a natural look (I’m tres jealous) then go for it! Aww, too kind… I’m just irritated by my lack of imagination at the moment. I should break out some simple palettes and force myself to go with the suggested shades. You look really pretty like this, though! Entirely appropriate for your Mum’s birthday, and I like your hair as well. Hmm. A lot of the bloggers that I follow do really bright, crazy eye makeup – not really sure if that’s your thing! If you ever get interested in Asian cosmetics, she’s the girl to go to! Please please talk a bit more about BB creams? I’m dying to try one but I keep hearing good things about loads of different brands and don’t know which one to choose but you have the same colouring as me and I have a lot of pink/red in my face that I want to cover and it looks like the one you have covers it well! I only own a few BB creams but am happy to share what I’ve got and dig out some links to the fab blogs that got me lusting after them a couple of years ago. You look so pretty and the MaxFactor mascara makes your lashes look amazing. Such a fabulous mascara isn’t it? I have to agree with everyone else, that neutral/ natural is usually best for parents/ relatives related events! You wouldn’t want to turn up looking like Ru Paul, would you?! I JUST WANT A CHANGE! But no, perhaps not anything as obnoxious as Ru Paul! That’s very kind of you to say, I feel like a right moaner but it frustrated me that the one time I had carte blanche to do what I wanted… and I ended up with my everyday look. I think I’ve fallen out of love with eyeshadow. I think the look is perfect for mum’s day and for this time of year. You look very fresh and pretty. As I get older, I find less makeup makes me look less OLD. Of course there’s using less product and then there’s the *appearance* of using less. I still wear some kind of base, even if it’s tinted moisturizer, a luminizing blush, eyeliner, mascara, and lip color. At a minimum. I usually toss in 1-2 eyeshadow colors, too and still manage to pull off the almost-no-makeup look. I second Pixiwoo tutorials and would add Lisa Eldridge. if I revealed my mother’s age on the internet she would actually murderise me. Kill me. You are a brave woman! Have fun finding your inspiration, lovely! Ohhhhhhhhhhhhhhhhhh GOD…. I’ve only gotten as far as the first link and I wanna break out my eyeshadows. Kirstie, that’s hilarious! My mother is now younger than I am. At least according to her, lol. It’s like the Curious Case of Benjamin Button! You look so pretty. I like it. Couldn’t Chanel have come up with a nicer name than ‘Ming’ though?! Agreed. It took me all my grown-up ness not to do an (er) at the end of the product list. You dont look dull to me! You look glowing and natural. Perfectly fine for a lazy Sunday. I think you look gorgeous! I’m also in a lazy makeup phase (I prefer to call it a “natural makeup phase”) and I’m just rolling with it because I know the urge to wear makeup that requires effort will strike soon. Maybe. You look absolutely beautiful. “Lazy?” Well, you might feel lazy, but you certainly don’t look it. I can’t get over how gorgeous your eyelashes look! You look gorgeous. I’ve been so uninspired recently too so I’m going to swap all my make up around so that other stuff is to hand and see if that works, because I’ve been so safe recently that it’s driving me mad. I think you look beautiful!!! I can’t seem to get away with that simple a look. Fresh and pretty! biorequiem.com- Specifically the “Blush Response” section! With an 18 month old underfoot, I hardly have time to apply a face much less be creative about it. No matter how many “ooh pretty” colors I acquire, I find myself going back to the tried and true neutral, boring looks. Simple yet effective. You look beautiful.